So this isn't going to be the prettiest post you've ever seen here, but it might be the tastiest. Earlier this month, Ellie and I were in the mood to bake, and I realized I had two tubes of crescent rolls + a new jar of Nutella. I did a quick Pinterest search for monkey bread from crescent rolls. I've never made monkey bread but I've heard friends swoon about using crescent rolls to make it. So after reading a couple of recipes, I decided we would dive in and just do our own thing inspired by the recipes. First, we rolled the dough into one big rectangle (I just pinched the perforations together). Ellie LOVED this part, especially sprinkling the flour all over the place. 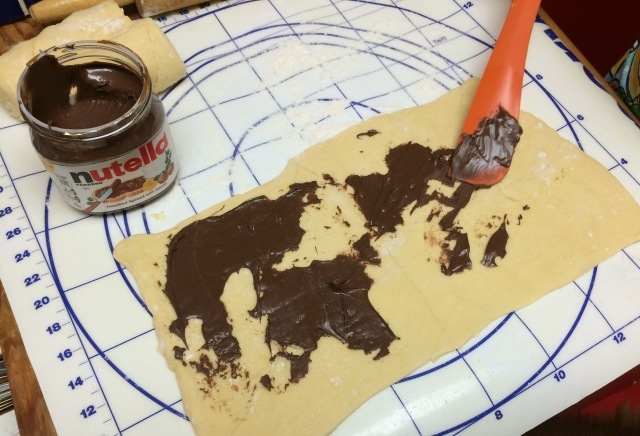 Second, we spread some Nutella. This was as difficult as it looks in this photo. Super sticky. Next time I would put the Nutella in the fridge overnight to keep it good and cold, which would have made it so much easier to spread. But this was also Ellie's first time having Nutella. Licking the spatula off did not disappoint. Third, I used a pizza cutter to slice thin strips of the dough. About one inch or so worked best (I'm not much of an even cutter or slicer so they widely varied, which didn't matter at all). Fifth, I brushed about two tablespoons of melted butter over the top because based on the the recipes I read, this would help them brown. And, well, BUTTER! And then because I'm a wee bit crazy, I also sprinkled on some cinnamon and sugar. It. did. not. look. pretty. Sixth, we baked them at 350 for about 18-22 minutes. I started checking at 12 and used the toothpick test to determine doneness and stopped keeping track of the amount of time. About one episode of Mickey Mouse Clubhouse. When they came out of the oven, they were all smooshed together and still not that pretty. But the taste? Oh my goodness. The best. And a perfect way to use up those crescent rolls. And to put it mildly, Ellie is a bit delighted to have Nutella in the snack rotation.